Size: 7.5" x 3.4" x 0.65"
• Crowded, confusing keyboard: Introduction of the TI-Nspire CAS with Touchpad in April 2010.
option for the TI-Nspire with Touchpad. • Low-contrast of the display and rather bulky housing: Announcement of the TI-Nspire CX CAS in February 2011. • Lack of 3D graphing: Upgrade of all TI-Nspire calculators to Operating System 3.0 (April 2011). 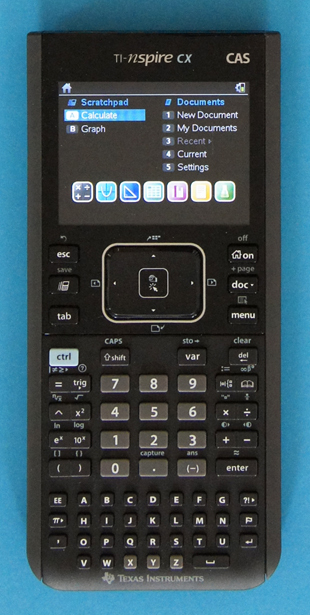 But there is no free lunch, the new TI-Nspire CX handhelds shed some size and reveals an outstanding design but the concept of replaceable keyboards are gone – and with it the TI-84 Plus compatibility. The TI-Nspire CX and its sibling TI-Nspire CX CAS feature a 16-bit, 320 x 240 backlit display capable of 65,536 colors. The scanning process used for the images provided by the Datamath Calculator Museum can’t reproduce the one-of-a-kind quality of the calculator screen and we had to invest in some new equipment to photograph it accordingly. Casio introduced already in October 1985 with the fx-7000G the world’s first graphing calculator and created in 1996 with the CFX-9850G a variation with a 3-color screen, but it took till January 2011 to reveal with the Casio Prizm (fx-CG10, fx-CG20) the first models with a high-resolution (384 x 216 pixels) full color display. Texas Instruments announced together with the TI-Nspire CX family a new Wireless Network Adapter to connect the calculators with the TI-Nspire Navigator system. A huge progress compared with the previous TI-Nspire Wireless Cradle used for the original TI-Nspire calculators. The TI-Nspire CX Docking Station charges up to 10 units in 6 hours. It can also be used to update the Operating Systems of the calculators. The new TI-Nspire Operating System 3.0 allows not only 3D graphing but the import of real-world images to view, graph and analyze for example the outline of the path of a basketball. The new OS is compatible with the original TI-Nspire calculators, too. Obviously it will display color images only in grayscale. The new TI-Nspire Lab Cradle requires the new Operating System 3.0 (introduced in May 2011) or higher. The featured calculator is an early prototype of the TI-Nspire CX calculator and Texas Instruments asked us not to open the units. Fellow collector Xavier Andréani reported recently a CPU speed of 132 MHz, 64 MBytes of SDRAM and 128 MBytes of NAND Flash-ROM based on the BOOT log of his unit under investigation. Since the TI-Nspire CX CAS lacks a QWERTY keyboard it is permitted (as of March 10, 2011) for use on SAT, PSAT and AP exams. Calculators with computer algebra system (CAS) functionality are not allowed on ACT exams.